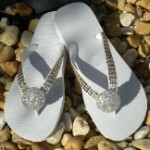 Extra ICY and, oh so Glam, Havaianas flip-flops with Swarovski Crystals - most comfortable flip-flops in the world! Perfect for lounging at the pool in style, they are a Fashionista's must-have. Type desired flip-flop color/center piece combination in Comment Box if you dont see it. All ICY items are custom made, please allow some time for production. 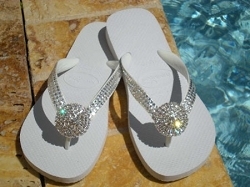 Spectacular Swarovski ICY Havaianas have created an unprecedented cult following. Havaianas referred to as the "best rubber sandal in the world" and can be seen gracing the pages of the hottest fashion and sport magazines, strutting down the runways at New York Fashion Week and featured at the Red Carpet events. Thats why we choose Havaianas brand as a base for your ICY Glam Signature Collection. Enjoy! If you own, or represent a hotel, spa, or a beauty salon, you will soon find out that ICY Glam Havaianas Collection is a hot seller. Business owners and representatives, email us for wholesale information. Colors of flip-flops & Icy center jewels can be mix-matched. Custom designs are accepted.